(Nanowerk News) The dynamic space environment that surrounds Earth - the space our astronauts and spacecraft travel through - can be rattled by huge solar eruptions from the sun, which spew giant clouds of magnetic energy and plasma, a hot gas of electrically charged particles, out into space. The magnetic field of these solar eruptions are difficult to predict and can interact with Earth's magnetic fields, causing space weather effects. A new tool called EEGGL - short for the Eruptive Event Generator (Gibson and Low) and pronounced "eagle" - helps map out the paths of these magnetically structured clouds, called coronal mass ejections or CMEs, before they reach Earth. EEGGL is part of a much larger new model of the corona, the sun's outer atmosphere, and interplanetary space, developed by a team at the University of Michigan. Built to simulate solar storms, EEGGL helps NASA study how a CME might travel through space to Earth and what magnetic configuration it will have when it arrives. The model is hosted by the Community Coordinated Modeling Center, or CCMC, at NASA's Goddard Space Flight Center in Greenbelt, Maryland. The new model is known as a "first principles" model because its calculations are based on the fundamental physics theory that describes the event - in this case, the plasma properties and magnetic free energy, or electromagnetics, guiding a CME's movement through space. Such computer models can help researchers better understand how the sun will affect near-Earth space, and potentially improve our ability to predict space weather, as is done by the U.S. National Oceanic and Atmospheric Administration. Taking into account the magnetic structure of a CME from its initiation at the sun could mark a big step in CME modeling; various other models initiate CMEs solely based on the kinematic properties, that is, the mass and initial velocity inferred from spacecraft observations. Incorporating the magnetic properties at CME initiation may give scientists a better idea of a CME's magnetic structure and ultimately, how this structure influences the CME's path through space and interaction with Earth's magnetic fields - an important piece to the puzzle of the sun's dynamic behavior. 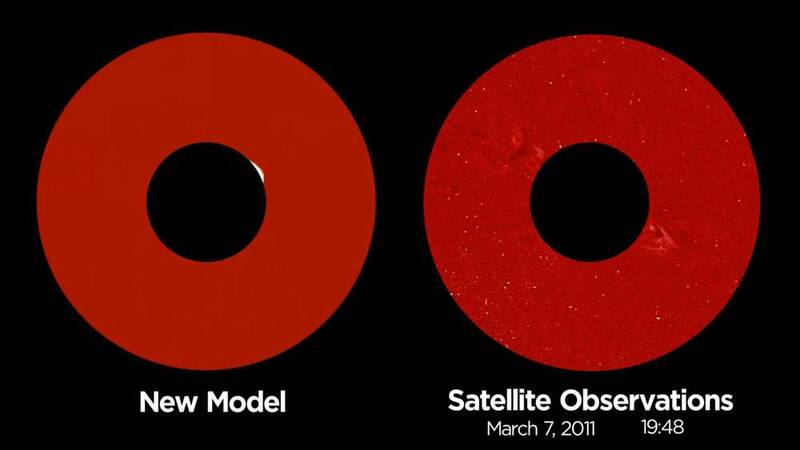 The model begins with real spacecraft observations of a CME, including the eruption's initial speed and location on the sun, and then projects how the CME could travel based on the fundamental laws of electromagnetics. Ultimately, it returns a series of synthetic images, which look similar to those produced of actual observations from NASA and ESA's SOHO or NASA's STEREO, simulating the CME's propagation through space. A team led by Tamas Gombosi at the University of Michigan's Department of Climate and Space Sciences and Engineering developed the model as part of its Space Weather Modeling Framework, which is also hosted at the CCMC. All of the CCMC's space weather models are available for use and study by researchers and the public through runs on request. 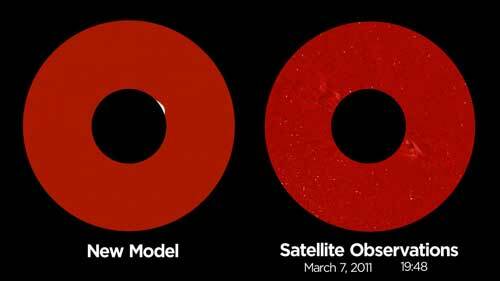 In addition, EEGGL, and the model it supports, is the first "first principles" model to simulate CMEs including their magnetic structure open to the public.